Please tell us your height, weight, and shoe size when booking. The minimum age to join is 16. Children under 18 must be accompanied by a legal guardian. 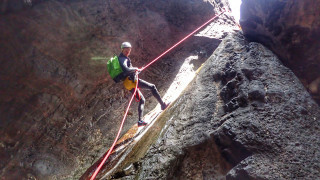 Although suitable for beginners, a reasonable level of fitness is required for this tour. 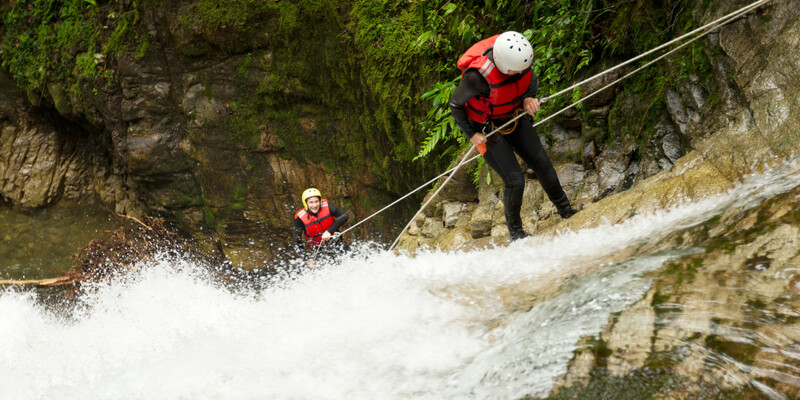 Steady feet and the ability to move through rough, wet terrain is beneficial. After the canyoning, we hike back up. If you suffer from vertigo, this might be challenging. Feel free to contact us and we can discuss if it'll be okay for you. This tour lasts between 6 to 8 hours, depending on the group's abilities, preferences, and speed. What to bring: Swimsuit, shorts & T-shirt (for hike), appropriate footwear for hiking, flip-flops for after the activity, water (we recommend at least 1.5 l), lunch, snacks. 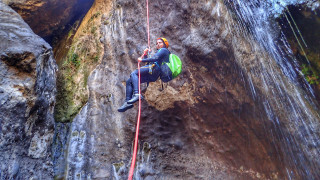 Canyoning in the Los Carrizales canyon is a thrill-ride only available to a limited number of people in order to protect the fragile ecosystem. 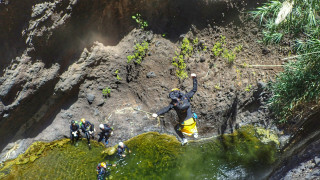 It's a rare gem on the island of Tenerife, and it is pure fun from start to finish. Once everyone's gathered at our meeting point at 9:30 a.m., we make our way to Teno Nature Reserve. Settled among picturesque villages, the area shows off Tenerife's famous landscapes of rugged volcanic island rock and green, lush flora. 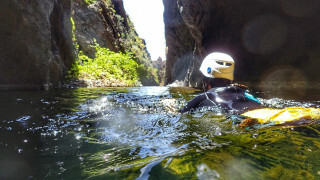 In the middle of the reserve, hidden from the typical tourists, we reach our canyoning starting point. 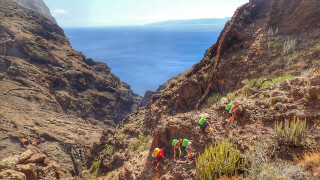 This beautiful Los Carrizales canyon has a fragile ecosystem, and Tenerife's locals make sure it remains protected. We keep our groups at a maximum of six people, and the local authorities limit the daily visitors to 15 people a day. There is plenty of excitement from the very start of our adventure. With ten abseils, a number of water-slides, and optional jumps of up to 8 m (26 ft), you can expect a rush of adrenaline around each corner. If you're not much of a jumper, no worries - all jumps above 1.5 m (5 ft) can easily be avoided. Thanks to our high-quality equipment, we negotiate the rough terrain with absolute safety. Your guide is always ready to explain or assist with anything you need, so even beginners are welcome. The entire experience lasts between six to eight hours, and we take a lunch break when the group decides it's time to refuel. Make sure you pack a good lunch, some power snacks, and water. After the canyoning, we hike back up to the dry land above. Some people find this to be a bit of a challenge, especially if they suffer from vertigo. Otherwise, the views we get to see during our hike make the effort absolutely worth it! 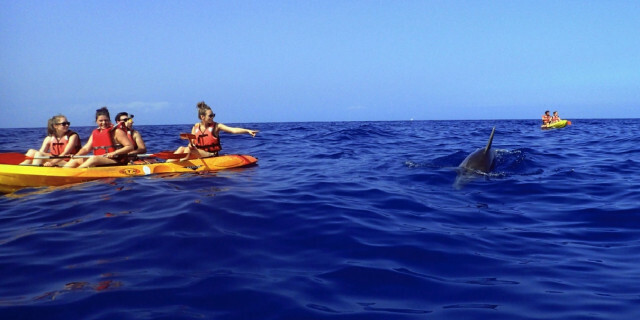 If you're in need of a real burst of fun in Tenerife, this will satisfy that craving to the max. It's a full day of exploration that keeps you laughing and smiling until the very end.